Now on NaijaBet it doesn't matter if you are losing a ticket or winning, you can always make money anytime, anywhere and on any ticket or bet. When you place a bet, the odds corresponding to the initial cash out value will be defined. As long as the chosen market remains active, you can cash out your money and withdraw a part of the amount placed. 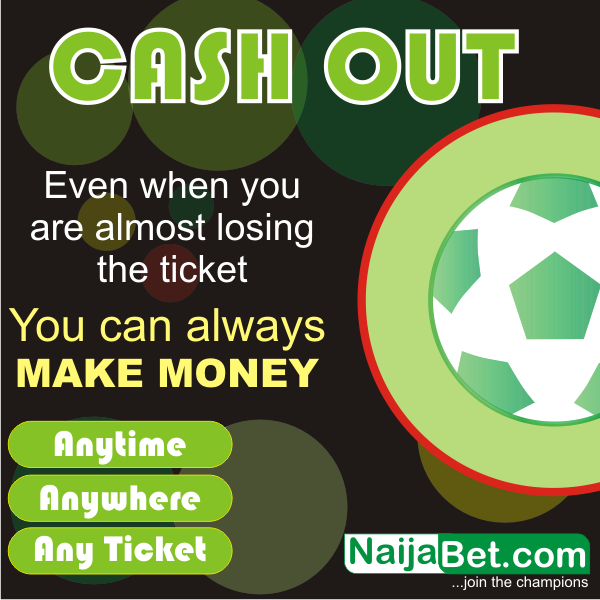 The cash out amount depends upon the probability of the chosen outcome at the time of cash out. For example, if the chance for the chosen outcome was 50% at the beginning, but at the time of cash out it decreased to 30%, then the cash out amount will be less than bet amount. And vice versa, If the chance for the selected outcome was 50%, but it increased to 90% at the moment of cash out, then the cash out amount will be bigger than the bet amount and will almost equal to the total potential payout. What this means is that if you play combined bets and some games have won and you are afraid one or two teams will spoil the ticket, you can cash out your winnings and your account will be credited with the amount you saw during cash out.